The new DK Baby series features an eye-catching design-with a gingham spine and patterned endpapers-and simple words and concepts for babies. Baby Days: A Special Book of Pictures and Words to Share with Your Baby, by Penelope Arlon, with photos by Dave King and Andy Crawford, includes poems, games and activities, and photographs of babies and familiar objects. A die-cut hole in the cover reveals a baby's face, and a red-and-white gingham ribbon closure lends the book gift appeal. The paper-over-board Baby Fun series includes Baby Fun: Five in the Bed and Baby Fun: One Little Duck, with photos by King. 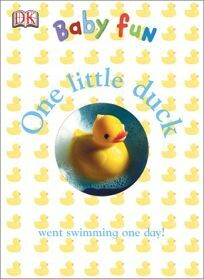 Both combine rhyming text based on popular children's songs with photographs of plush animals under the covers, or rubber ducks in the tub on sturdy board book pages (and a die-cut hole in the cover). A quartet of Baby Love board books with padded covers includes Baby Love: I Can; I Feel; I Like; and I See. Bold close-up photography and a line of text per page convey the things babies experience, from a warm breeze to a favorite teddy bear.